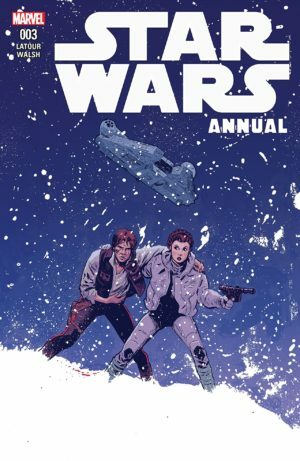 REVIEW: Star Wars Annual #3 – "Leia Starring in Die Hard"
Han and Leia look for a location for a new Rebel base, but only find a new enemy. Will Han’s past catch up to destroy them both? Plot: Exploring old caves used by smugglers sounds like a bad idea, but that doesn’t stop Han from taking Leia to Odona in search of a new base. Their official mission takes a backseat when a former associate from Han’s past named Frax shows up. And he doesn’t just want money, he wants revenge. 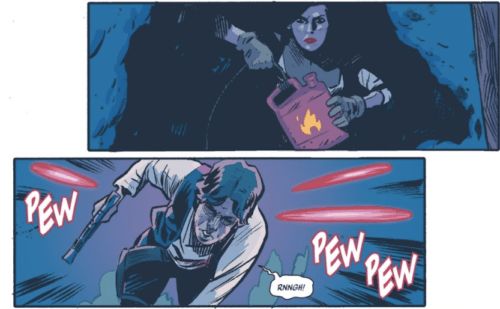 Story: When Jason Latour announced this issue a few months ago he tweeted that he pitched this story as “Leia starring in Die Hard.” Well, we already knew Leia is as tough as John McClane and this issue proves it. She’s not “just a princess,” as the mercenaries point out and Latour’s story reminds us why she’s such an icon. But more than just an action story, this issue is also a sweet ode to the relationship of Han and Leia. The best part of their shared panels is the insults they trade, each one betraying just a tiny bit of their affection. Latour is clearly a student of Star Wars because his dialogue captures their dynamic perfectly. This story would be a joy to read for even a casual Star Wars fan who doesn’t usually pick up the comics. While the story isn’t bogged down with obscure details or references, Latour does introduce an entirely new character in Frax. However, Latour develops Frax’s backstory swiftly and succinctly, fitting it into the page limit while still managing to create a 3-dimensional character who has clear personality traits and motivations. Introducing an entirely new character in the span of just one issue and making them the main villain seems like a risk, but it works. Art: There is a lot going on in this book, and Michael Walsh has fun with it in the art. From tie fighters to creepy creatures to laser blasters, there’s a lot of fun Star Wars elements to play with and Walsh takes full advantage. I didn’t keep count, but there’s some sort of a fire or explosion at least every few minutes, delivering on the promise of an action thriller. When Han and Leia are separated, I enjoyed the use of parallel panels to show their seperate journeys. With Star Wars books, it’s always important to me that the worlds look developed and distinct. Walsh does this not only on Odona but also the world Frax works on after he’s captured. The color palette and details, like the skyline in the back and coral reefs, gives you a strong sense of what kind of place this is without actually spelling it out in the text. I also love the character expressions of Han and Leia. While the art isn’t an exact mimic of the live-action actors, the movements and reactions capture the essence of the roles very well. Frax and his gang are interesting looking, though I won’t pretend to know what species they’re all supposed to be. Frax would look almost amphibian if it wasn’t for his red skin. 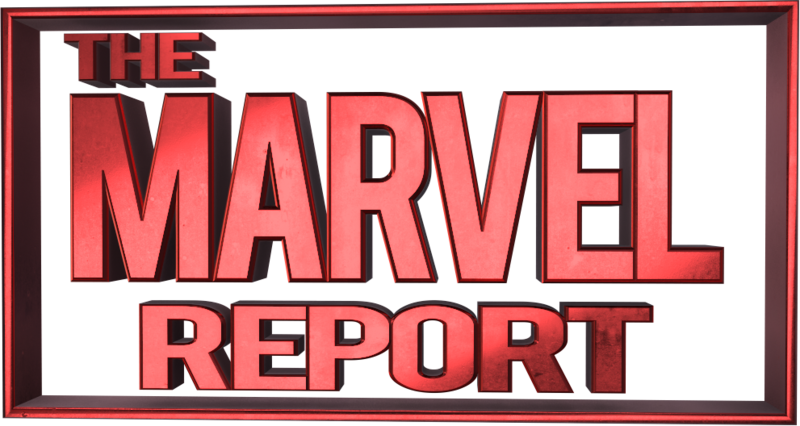 Verdict: I guess it was too much to ask to have Leia shout “Yippie Ki Yay Motherf*****!” Other than that missed opportunity for Die Hard homage, this was a great annual. Any Star Wars fan, even if you’re not current on this series, can pick up this issue and enjoy the time spent with Han and Leia teaming up. When these two are together, you know it’s going to be entertaining. Combined with some beautiful art that makes me wish it was winter instead of this unseasonably warm September, this issue is the total package. Peter Parker Goes Symbiote In a Crossover Event! Comixology Gives Away Iron Fist Vol One, Today Only!